I am super excited to share our tips for visiting Volcano Bay with young kids with you! Volcano Bay is an awesome water park at Universal Orlando Resort in Florida that the whole family will love. We visited Volcano Bay when our four kids were all between 5-10 years old. It was a relaxing (yes relaxing, even with 4 kids) and enjoyable time for all of us. I didn’t get to sit on a beach chair and read a book but we did enjoy the day and wished the park would have stayed open longer because we weren’t ready to leave. Here are my top 5 tips for visiting Volcano Bay with young kids. Find a place to set up and put down all of your stuff. We didn’t rent a locker but instead just kept everything with us at our chairs. Yes, we did just leave it unattended sometimes… hoping no one would steal anything. Consider purchasing a wearable waterproof pouch for your phone. You don’t need to bring in a lot of credit cards or cash because you can set up your TapuTapu to pay for everything inside Volcano Bay. We recommend setting up at the TeAwa The Fearless River entrance. It was back in the corner of the park and not that busy so it felt like a good fit. Plus it has sand, which is fun for little kids who like to dig and play. The entrance to the river is shallow so young children can play in the water without getting pulled into the rapids. It was nice to have a base for the day and we did take breaks there several times. For the last couple hours of the day we packed up and moved over to the beach area right in front of the Volcano so we could hang out in the wave pool and grab a drink. There is sand all around the beach chairs at Volcano Bay. Pack a few sand toys in your bag. When you find your spot, slide the beach chairs over to make a nice little spot for them to play in the sand while you sit and watch the other kids play in the water. Universal Orlando’s official policy allows only water, snacks, baby food and food for special dietary needs into the parks. With picky eaters, we didn’t want to spend a ton of money or time on food. We packed a simple bag of bread, peanut butter and jelly, oranges and some chips. This meant we could grab a quick lunch and we had food we knew everyone would eat. They searched our bags when we entered and no one said anything. We also brought a couple big Hydro Flask water bottles filled with water for our family to share. There are some rides at Volcano Bay that could really scare young kids so check out the Things to Do at www.universalorlando.com before you go. There are plenty of attractions that are not scary to keep younger kids happy! Taniwha Tubes was perfect for our 5 year old and the lines were usually really short. The wave pool was always a winner and they have complimentary life jackets available. The Fearless River was also good if you go with your kids and hold on to their tube so that you can float down it together. The Kopiko Wai Winding River was perfect for kids who want to go by themselves or anyone who likes a lazy river. Our 5-year-old can swim and also could touch the bottom of Kopiko Wai. Tot Tiki Reef and Runamukka Reef are play zones reserved especially for young kids. They were located a short walk from our base at TeAwa The Fearless River. Your kids will definitely want to check them out. We like the off-season when lines are shorter and there are just less people around. Orlando’s off-season is anytime most kids are in school. I would avoid spring break, summer and the winter holiday season, if possible. You can swim year-round in Orlando, but winter temperatures will be cooler. Keep in mind that late summer and early fall are hurricane season, so plan some flexibility into your schedule and consider travel insurance if you book during that time. Even if you can’t avoid rain, stay inside Volcano Bay when it pours. Rain in Florida often doesn’t last long and then you’ll have the park to yourself. We went in November and the weather was warm but not hot. Another day that week was cooler. If will be visiting all three parks at Universal Orlando, don’t schedule your Volcano Bay day until you know the weather forecast. Then pick the warmest day! You can get discounted tickets for Volcano Bay from Get Away Today Vacations. This family-focused travel agency works directly with Universal Orlando Resort and can save you $30 or more per ticket. Get Away Today can also help you with discounted Walt Disney World tickets, hotels and flights for your Orlando vacation. Click the button to visit www.getawaytoday.com. 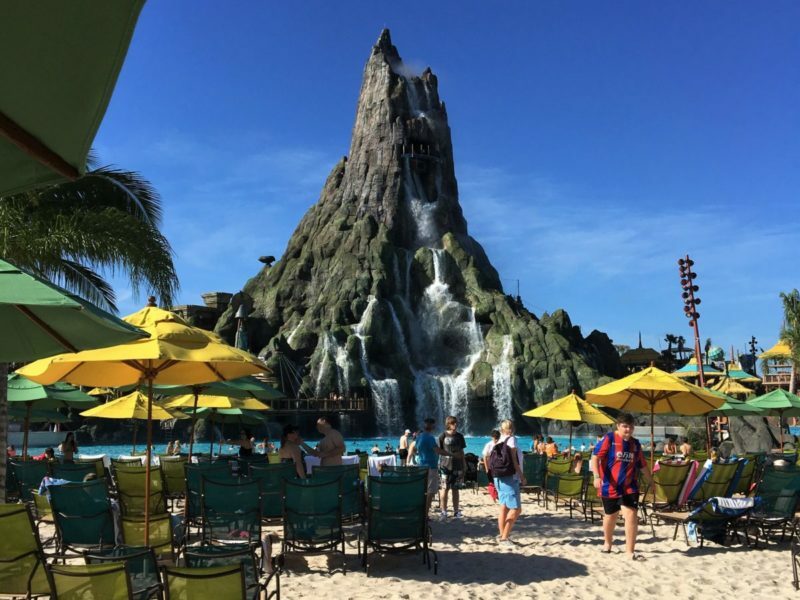 We also spent time at Universal Studios Florida and Universal’s Islands of Adventure and there were a few times I wished we were back at Volcano Bay taking in the beach vibe and relaxing in the water! Want more tips for Volcano Bay? Click the link to read more about my family’s Volcano Bay experience on my blog, Crazy Family Adventure. Click the button to read Allison’s tips for visiting Volcano Bay with older kids. Disclosure: Universal Orlando Resort provided my family with complimentary tickets to Volcano Bay for the purpose of review. All opinions are my own.